Eighteen-year-old, Punjab Boy rewarded his parents by securing Air India Rank 1 in the CBSE NEET Exam 2017. NEET Topper 2017 Navdeep Singh has earned 697 marks out of 720 in CBSE NEET Exam and shares his success story to the readers. Navdeep Singh was expecting the good rank in the NEET but becoming NEET Topper was beyond his dreams. About 11,38,890 students had participated in the NEET Exam 2017 out of these, 6,11,539 passed in this test in which Punjab Boy Navdeep Singh has ranked AIR1 in the exam. Navdeep Singh gives all the credit to their parents and family for this remarkable achievement. Navdeep Singh shares his success story and future planning’s with the media. 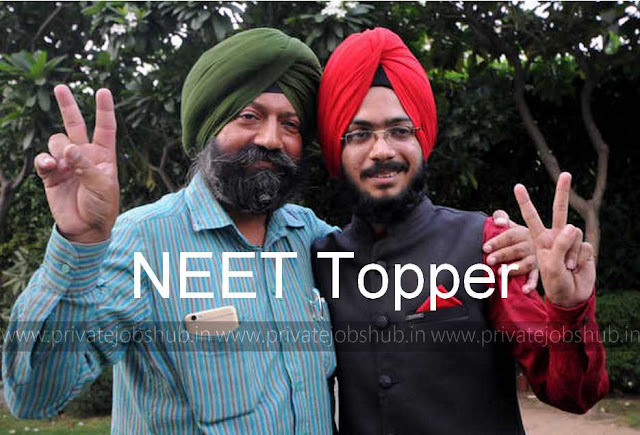 So you can take short glance of NEET Topper 2017 Navdeep Singh interview here. Navdeep Singh believes that with the passion and hard work to prepare for the exam, there is also a need to clear the topic. If all your topics are on the points then no one can stop you to achieve success. He also exclaims that he didn’t operate any social media like facebook or Instagram from last two years. Though Cricket is his first love but during the exam days, he controlled his affection. But when stress overcomes his strategies, then he played cricket just for mind relaxation. Navdeep Singh always preferred NCERT books to study Physics, Chemistry, and Biology to prepare for NEET exam. Navdeep Singh also said that he never follow the rote learning techniques in his studies. He also warned to the students who are preparing for the examination to not to become the bookworm, all you need to make all the topics in your point and you will surely achieve good marks in the NEET Examinations. He also said that he slept only 4hours in a day in the period of the NEET Exam Days and before last six months he used to sleep only 6 hours in a day. After securing the All India Rank 1st in CBSE NEET 2017 Exam, Navdeep Singh is aiming to take admission in the Maulana Azad Medical College (MAMC) in Delhi to achieve their dreams. Navdeep Singh wants to help the cancer patients from all over the world and wants to pursue the course related to cancer treatment. NCERT Biology of Class XI and XII. 6. GRB Bathla's Publication's for Biology. NCERT- Physics Part 1 and Part 2. D C Pandey Objective Physics. Fundamentals of Physics by Halliday, Resnick and Walker. Problems in General Physics by I. E. Irodov. Physical Chemistry by O.P. Tandon. Organic Chemistry by Morrison and Boyd for Organic Chemistry. Modern's ABC of Chemistry for class 11th and 12th. Concise Inorganic Chemistry by J. D. Lee for Inorganic Chemistry. Dear Visitors!! You can also read the others Toppers Story, then must check out our web portal of www.privatejobshub.in. We hope that after reading the success story of NEET Topper 2017 , you will get motivation to crack your examination. Thankyou! !